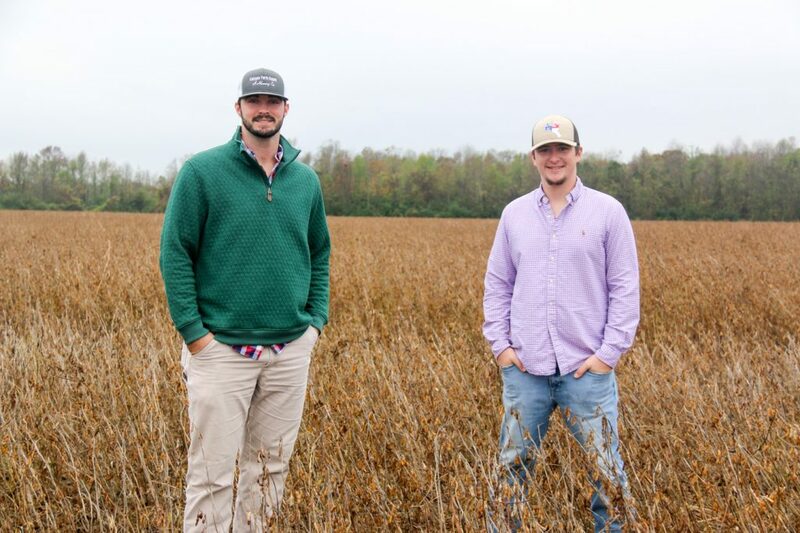 MOUNT OLIVE –Friendship, family, and faith are the bonds that tie together Sampson County natives Hunter Britt and Ty Hunter. Friends since birth, Hunter and Ty attended the same school growing up, graduated from Hobbton High School together, attend Mount Vernon Baptist Church, and share a passion for the outdoors. The pair also attend the University of Mount Olive (UMO) where Ty is majoring in ag production with a concentration in business and Hunter is majoring in ag business. Ty enrolled at UMO straight out of high school, in the fall of 2016. “I have always been interested in agriculture,” he said. Having a good work ethic is something that comes naturally for Ty. He recalls having labored many summers for local produce farmer, Danny Joe Pope. Ty packed peppers and squash; the hours were long, and it was hot and dirty work. However, the lessons Ty learned about responsibility, dependability, and hard work have stuck with him. He has applied those lessons often at UMO. All UMO ag majors are required to do an internship before graduating. This past summer, Ty completed his internship with Pope and Son out of Clinton. Ty is keeping his options open, but one thing is for certain, he hopes to keep his roots tightly connected to Sampson County. Ty’s good buddy, Hunter, has a similar outlook on life, labor, and a love for the outdoors. The two can often be found duck hunting in the swamps around their homes, or deer hunting from a tree stand…waiting, watching, and wishing for the next “big one” to show up. “I got my first buck when I was six years old,” Hunter boasts. “Well, I got my first deer in the third grade, but I have been hunting since the second grade,” Ty added with a smile. The friends share more than a passion for hunting. They both have a shared faith that has been cultivated in the walls of Mount Vernon Baptist Church where the two attend with their families. “When half of the congregation is related to you, you know it truly is a church family,” Ty laughed. Hunter recalls helping build wheel chair ramps for those in need, and participating in derby car races as a youngster in RAs (Royal Ambassadors). Hunter’s faith and trust in God are two things that he feels led him to attend the University of Mount Olive; that, and a passion for baseball. Hunter started his college experience on a baseball scholarship at ECU. He opted to be redshirted during his freshmen year to maintain athletic eligibility. He then decided to transfer to UNCW. It is a decision he has not regretted. Hunter is a right-handed pitcher and is slated to be a starter for the Trojans during the 2019 season. His fast balls range in the low to mid 90s. Most would call Hunter a late bloomer in the baseball world. He didn’t start playing the sport until his sophomore year in high school. “I could throw hard and fast, but I wasn’t always in control of where it went,” he joked. By the time Hunter was in the eleventh grade, he had gained the attention of many scouts. At one time, he was listed as one of the top five pitchers in North Carolina and one of the top 100 in the nation. He talks about his abilities with a quiet humbleness. The six-foot-six-inch tall young man could be considered a gentle giant. On and off the field, he leads by example. Like Ty, Hunter worked for Danny Joe Pope for many summers during his youth, and also cut grass. This past summer, he had a brief job shadowing experience with Ag Technologies which gave him a glimpse of what his future might hold. He hopes to do an internship with them soon. Hunter would ultimately like to make it to the major leagues. And, the possibility is very real. He was once offered the opportunity, but turned it down. Good insight for a 20-year old. Probably advice that he learned from his parents, Barry and Lynette Britt, or from his grandparents, Loraine and the late Harold Britt of Faison and Lib and the late Franklin Pope of the Herring Community. And, it is advice that he will surely share with his brothers, Daniel-16 and Garrett-12. “My brothers like to come see me play when they can,” he said. On game day, Hunter can also often spot his friend, Ty, in the stands cheering him on. Adding to their many commonalities, Hunter and Ty hope to share the graduation stage in the spring of 2020 when they anticipate earning their degrees from the University of Mount Olive.